Those of you lucky enough to be looking skyward just before 2:00 yesterday afternoon were treated to a fly-by of FIFI, one of only two Boeing B-29 Superfortresses still in the air. The other B-29 continuing to take to the sky is Doc. FIFI tours the U.S. and Canada, taking part in air shows and offering flight experiences. 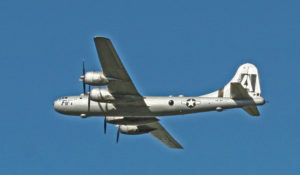 The B-29 is owned by the Commemorative Air Force and is based at the Vintage Flying Museum located at Meacham International Airport in Fort Worth, Texas. I happened to be sitting in my office (working as usual) and caught a glimpse as FIFI flew overhead on a westbound trip to Nellis AFB in Las Vegas for the Veteran’s Day Air Show. We were lucky to be on the flight path of that trip and had advance notice of when the flyover would occur. This, of course, generated a “Waiting for FIFI” party on one of our homeowner’s ramp and another occasion for good friends to get together. 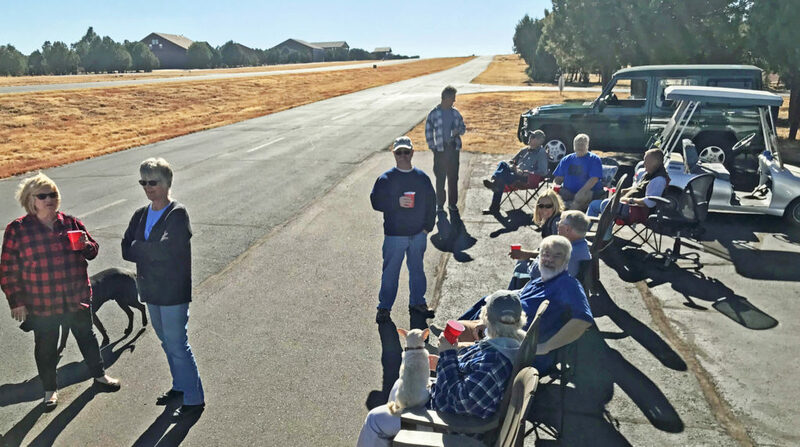 We were not disappointed when FIFI flew right over our viewing party on a beautiful clear fall Arizona day. The sound of those giant radial engines is something you don’t forget…..for friend or foe. Photos courtesy of Edd Weninger. This entry was posted in Uncategorized by LDriver. Bookmark the permalink.